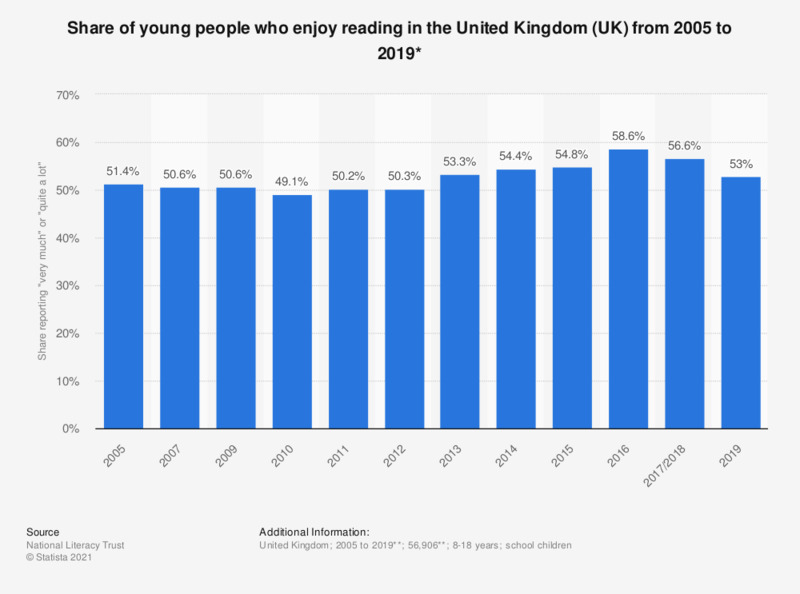 This statistic illustrates the proportion of young people who enjoy reading in the United Kingdom from 2005 to 2016. Among school children aged eight to 18 years in 2016, 58.6 percent reported enjoying to read. Share reporting "very much" or "quite a lot"
* Original survey question was, "How much do you enjoy reading?" ** The dates of most recent survey were November to December 2016. Data for some years not provided by the source. *** n (2013) = 29,422; n (2014) = 32,026; n (2015) = 32,569; n (2016) = 42,406. Base for previous surveys not indicated. In general, would you say that you read... ? How many books* have you read over the past year?